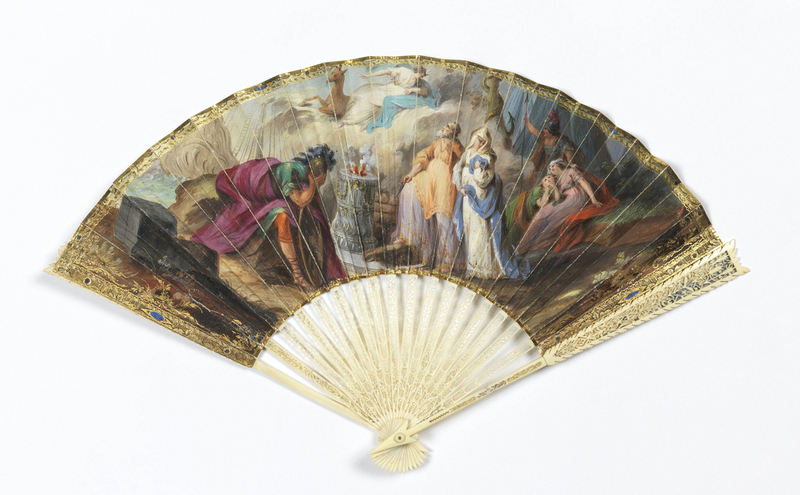 The subject of this fan is an episode from the Ancient Greek myth of the Trojan War. Agamemnon has vowed to sacrifice his daughter Iphigenia to appease Artemis, whose wrath he incurred by killing deer in a sacred grove. This fan illustrates the dramatic moment when the goddess takes pity on the girl and at the last moment substitutes the victim for a deer. When folded, the fan resembles an arrow, the symbol of Artemis the hunter. The motif is echoed in the delicately carved ivory sticks. French designs in the early nineteenth century commonly included militaristic elements such as arrows or shields. These symbolized the power and glory of the French regime. The arrow could also reference Cupid and the art of love. Pleated fan, late 18th–early 19th century, Europe, gilded parchment leaf painted with gouache; ivory sticks carved à jour; carved and pierced guards overlaid with gold foil; ivory button at rivet. Gift of Anonymous Donor.